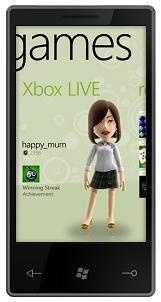 Microsoft has announced that its new Windows Phone 7 series of smartphones will feature tight integration with Xbox Live, with support for Gamerscore, Achievements and online gaming with the Xbox 360. In a keynote address at the 2010 Mobile World Congress, Microsoft's Joe Belfiore revealed that the company is bringing Xbox Live to its upcoming Windows Phone 7 series of smartphones. The new phones will use "hubs" to organize programs and content; the Games hub will give users access to Xbox Live data including Gamerscore, avatars and recent Achievements. More important, however, will be the games themselves: Belfiore didn't offer much in the way of specifics but said that the phones would support Xbox Live games and online multiplayer action with not just other phones, but also the PC and Xbox 360. Mobile gaming is a big and growing business, and what better way for Microsoft to carve off a piece for itself than to successfully turn the new Windows-based phones into a legitimate games platform that takes advantage of the huge preexisting Xbox Live audience? Some big changes could be afoot in the kingdom of the handheld if the company can pull it off. We'll find out soon enough: Microsoft CEO Steve Ballmer said the first Windows Phone 7 devices would be on the market in time for the 2010 holiday season.